Millions of people suffer from knee pain and stiffness – often due to degenerative joint disease like osteoarthritis. Physical traumas and joint diseases can significantly impair mobility and quality of life during even the simplest of activities. Although conservative measures are the first line of defense, many patients require extensive medical intervention to achieve relief for their knees. Total knee replacement is the choice of many patients and orthopedists because the procedure has a high rate of success. In fact, as many as 90 percent of patients achieve a significant reduction in knee pain following surgery. that the first knee replacement surgery was performed in 1968? 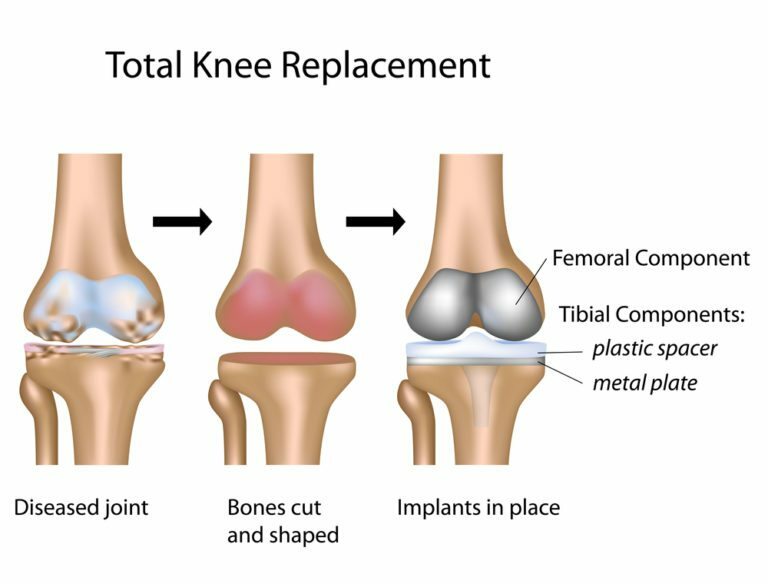 Now, the procedure is more popular than ever, with more than 700,000 people getting total knee replacements in 2010 alone. Artificial knee joints have changed the lives of millions of people from young to old. According to the American Academy of Orthopedic Surgeons, total knee replacements have been successfully performed in patients as young as 13. However, the majority of people eligible for this surgery are between the ages of 50 and 80. Am I a candidate for a total knee replacement? You may be a candidate for total knee replacement surgery if you have osteoarthritis or joint damage that has not adequately responded to more conservative methods of treatment, such as physical therapy. Although knee replacements are considered safe and highly effective, results still vary from patient to patient. It is important to discuss your options with your orthopedist to determine if total knee replacement is right for you. What should I expect during a total knee replacement? Total knee replacement surgery is an inpatient procedure that is performed using general anesthesia. Your doctor will make an incision, exposing the bone beneath. Damaged cartilage and a small amount of the bone will be removed and replaced by metal implants that are either cemented or pressed into the bone. Finally, your doctor may resurface your patella and insert a smooth spacer into your joint to facilitate fluid movement. The entire procedure usually takes no more than 1 or 2 hours. You will probably spend several days in the hospital after your surgery. During this time, the medical staff and your orthopedist will monitor your condition to ensure you are comfortable and that you are not developing unwanted blood clots after surgery. Your doctors and nurses will also work to prevent complications of surgery, such as pneumonia. Expect to begin a physical therapy regimen within 24 hours of your knee replacement. It will be important to continue these exercises for many weeks to facilitate a strong recovery.